Thirty-five students from six schools participated in the Society of Professional Journalists Colorado Pro Chapter college student internship and job fair on Feb. 19 at the Denver Press Club. The event was for underclassmen seeking summer internships and for May graduates interviewing for jobs. Thirty-five students from six schools participated in the Society of Professional Journalists Colorado Pro Chapter’s college student internship and job fair on Feb. 19 at the Denver Press Club. The SPJ Colorado Pro board sponsored the event so underclassmen could interview for summer internships and May graduates could interview for entry-level jobs. Greeley Tribune editor Randy Bangert, right, interviews Mike Tolbert of Metropolitan State University-Denver at the SPJ College Student Internship and Job Fair on Feb. 19 at the Denver Press Club. The session was scheduled for 1-4 p.m. and ran 30 minutes longer because many of the print, broadcast and digital students interviewed with three or four of the news organization representatives. The fair was open and free to students, and they were encouraged to bring their resumes, clips and portfolios. Loveland Reporter-Herald managing editor and Prairie Mountain Media representative Jeff Stahla, left, interviews Ashley Dumas of the University of Central Florida at the SPJ College Student Internship and Job Fair on Feb. 19 at the Denver Press Club. Janis Carrasquel Hernandez, a Metropolitan State University-Denver fall 2015 journalism graduate, said, “I enjoyed the job fair greatly. It was an occasion to meet face-to-face with Colorado’s prospective media employers and learn about what they are looking for. Mile High Sports web editor Michael Jaycox, far left, interviews a student at the SPJ College Student Internship and Job Fair on Feb. 19, at the Denver Press Club. Denver Post internship recruiter Alexandra Alsonso also noted the students’ appreciation for the interiew experience. Mile High Sports web editor Michael Jaycox appreciated the students’ enthusiasm in pursuing journalism careers. Denver Post internship recruiter Alexandra Alonso, left, interviews Rachael Worthington of Colorado State University at the SPJ College Student Internship and Job Fair on Feb. 19 at the Denver Press Club. “This was my first time representing Mile High Sports at a job fair, and I couldn’t have been more impressed,” he said. “The students and applicants were not only qualified and prepared, but engaging to speak with. What I was most impressed with, though, was their excitement to know more about the industry and different possible pathways towards a journalism career. Rocky Mountain Public Broadcasting president Laura Frank, left, interviews Jeffrey Will of Metropolitan State University-Denver at the SPJ College Student Internship and Job Fair on Feb. 19 at the Denver Press Club. Colorado SPJ partnered with the Colorado Press Associaton in visits to college journalism programs last fall, and the visitation team members emphasized the importance of internships. The Feb. 19 program was the first internship/job fair hosted by Colorado SPJ because the chapter board believed spring semester was a good time to reconnect with students. Jan. 30 — Colorado Press Women will start the new year with a program on “Exploring gender equity for professional women in journalism and mass communications in Colorado.” We are using this gathering to launch a conversation about how far women have come in our members’ professions, how far we have to go, and how we can “lean in” to level the playing field for women journalists and communications professionals. The panel discussion on gender equity features Tiffani Lennon, author of research on gender equity and a book Recognizing Women’s Leadership; Patti Dennis, longtime news director of 9News who is now vice president/regional news director and director of recruiting for TEGNA Media (formerly called Gannett Broadcasting); and Meghan Lyden, senior editor for photography and multimedia at The Denver Post. The event will be held from 9:30 a.m. to noon on Saturday, Jan. 30, at the CCD Confluence Building on the Auraria Campus. In addition to campus parking lots, the location is well-served by RTD’s Light Rail – the Colfax at Auraria and Auraria West stations for lines W,C,D,E,F,H. See Light Rail map for the line nearest you. The CCD Confluence Building is near Colfax. This is one in a series of interviews with Colorado journalists. “It’s always enjoyable to talk about the irascible Trumbo,” Laurena Mayne Davis said. Irascible. Academy Award winner. Controversial. National Book Award winner. Blacklisted screenwriter. Free speech champion. All of these adjectives describe the author and more people are talking about him now with the November release of “Trumbo” starring Bryan Cranston. The film received critical praise and not just because it features the Emmy-winning “Breaking Bad” actor. “Trumbo” is about one of the Hollywood Ten who was convicted of contempt of Congress after he refused in 1947 to reveal to the House Un-American Activities Committee the names of people alleged to have American Communist Party influence in the movie industry. Blacklisted during the 1950s, Dalton Trumbo won Academy Awards under pen names for “Roman Holiday” (1953) and “The Brave One” (1956). Those were just two in a long – and impressive – list of screenplays he wrote from 1936-1973. Trumbo first earned national attention when he won the 1939 National Book Award for “Johnny Got His Gun,” an anti-war novel about a young American soldier in World War 1. The writer gained local attention in Western Colorado with the 1935 publication of his first novel, “Shale City.” Born in 1905 in Montrose, Trumbo grew up in Grand Junction. He attended the University of Colorado-Boulder in the 1920s and in 1993 CU dedicated a campus fountain court to him in recognition of his free-speech celebrity status. The portrayal of Grand Junction residents in “Shale City” sparked a hostile reaction. And that’s why Davis, former managing editor of The Daily Sentinel, is involved in the Trumbo story. Today, she is an instructor at Colorado Mesa University teaching Media Theory, Writing and Reporting for Media, and Mass Media: Impact and History. Question: In your 2007 book “125 People/125 Years: Grand Junction’s Story” you wrote: “(Trumbo) is the city’s most accomplished artistic export by far, but the supportive warmth from his hometown chilled with his 1935 publication of ‘Eclipse,’ a novel in the vein of social satire that angered townspeople who recognized, or thought they recognized, themselves in it.” How long did their animosity last? Davis: Decades, I’ve heard, although those with long-term grudges likely were a vociferous few. Additional hometown animosity later was heaped on Trumbo during the Cold War, due to his affiliation with communism. For people predisposed to not like him following “Eclipse,” that was a one-two punch. For many people — in Grand Junction and elsewhere — during that period of hyper-nationalism, the Hollywood 10 were not viewed as defenders of the First Amendment, but as traitors. Question: You also state in your book that Trumbo wrote for The Daily Sentinel while he was a student at Grand Junction High School. Were you able to find any of his stories in the newspaper’s archives? Davis: My students have found them. In 2005 I taught a class titled “Dalton Trumbo’s Legacy” at Mesa State College, now Colorado Mesa University. We read four books, watched 10 of Trumbo’s films, did a read-through of his play “The Biggest Thief in Town” and went on a tour of significant sites, including his boyhood home. Students also had to complete a final project. For that project, some students pored over microfilm of The Daily Sentinel during Trumbo’s tenure as a cub reporter and printed off everything with his byline. It was standard beginner fare: high school news, service club meeting reports, etc., but it’s fascinating to read that early boilerplate and realize the same writer went on to win a National Book Award and two Academy Awards. Question: When “Eclipse” was reprinted in 2005, it included a “Who’s Who in Shale City” list of the book’s characters with their real-life inspirations. What was the community reaction to the list? Davis: The old-timers got out their own lists and compared them! There was a lot of overlap. It fostered some good-natured discussion. Question: In October 2007 a bronze antique bathtub with the naked 62-year-old Trumbo was installed in front of the Avalon Theatre in downtown Grand Junction. The downtown has many impressive sculptures but why was the bathtub — from an old black-and-white photo of the writer — selected? Davis: Trumbo was an outsized personality. A traditional bust hardly would have been appropriate. The photo, which shows Trumbo writing in his bathtub, was taken by his daughter Mitzi. Trumbo family members were consulted to make sure they would not be offended by a whimsical selection. They loved it. Legends Committee members, who first united for the Trumbo statue, have gone on to raise money for the installation of eight more bronzes of historical figures. All include storytelling elements. The Trumbo statue is a draw for impromptu seasonal decorating, whether it’s a Broncos beanie or a Santa hat. During the local special showing of the biopic “Trumbo,” the statue had a top hat. Question: What was the public reaction to the sculpture? Davis: Probably divided along the same lines of those who either admire or dislike Trumbo and what he stood for. Some appreciate the humor; some don’t. One thing’s for sure, though, even if people don’t know Trumbo from history, they know about “the guy in the bathtub downtown.” It’s a conversation-starter. Question: In earlier interviews you said you included Trumbo in your Colorado Mesa University class discussions. What were the discussions? Do you do that now in your classes? Question: With free speech being unfiltered today in social media, do students appreciate Trumbo’s defiance and courage in the 1940s? Question: Have you seen the Bryan Cranston movie? What do you think the community reaction will be to the film? Davis: Members of the Legends Committee arranged for a special showing of the biopic “Trumbo” at the Avalon Theatre, on Nov. 13. It sold out. Trumbo’s daughter-in-law, Nancy Escher, spoke before the movie, as did a handful of people from the Legends Committee. As if witnessing a live performance, the audience clapped when the film was over. It really was a special, and perhaps a redemptive, moment. Larry Ceplair, who earlier this year published a fantastic new biography, was there to sign copies of “Dalton Trumbo: Blacklisted Hollywood Radical.” Trumbo’s son, Christopher, had planned to write the book, but he died from cancer before he could. He knew and liked Ceplair from his previous books and handed over his notes and family memorabilia to him. It’s amazingly well-researched. Anyone curious about Trumbo will learn much about him from Ceplair’s book. The Colorado Pro Chapter of the Society of Professional Journalists partnered with the Colorado Press Association this fall in arranging visits to the state’s four-year university journalism programs. The visitation teams were comprised of SPJ and CPA representatives, most of whom were with daily and weekly newspapers near the campuses. Ethics and news judgment were discussed during each visit, either with ethics classes or reporting and newswriting classes. Copies of the SPJ Code of Ethics were distributed in each class and the visitation team members asked real-life ethical questions. 1. Should your news organization identify the gunman in a mass shooting on a college campus in your city? Or should you subscribe to the “no noteriety” campaign to not name mass murderers? What would you do? 2. In early September, a BBC reporter interviewed a Syrian who was walking with other refugees in Hungary toward the Austrian border. A few seconds into the interview, the man asked the reporter to help him and his family. They were thirsty, hungry, tired and his children needed shoes. If you were the reporter, what would you do? 3. You are a TV reporter and the newly elected sheriff in your county asks if you would coach him on how to conduct large news conferences. He says he is comfortable in one-on-one interviews but doesn’t have news conference experience and feels nervious facing a group of reporters and TV cameras. What would you do? 4. You are a TV news director and your station manager wants to establish a policy to avoid conflicts between your staff’s consumer reporting and the station’s advertising clients. Should you push for a firewall that forbids communication between the newsroom and the advertising department? Or should you opt for a policy in which the ad department is advised not to schedule certain ads during a newscast that will feature a critical consumer story? What would you do? 5. You are the editor of a daily newspaper and you hire a young out-of-state reporter to cover the business beat. Two months into the job, you get a telephone call from a local businessman who said after the reporter interviewed him for a story, he asked if his company is looking for a public relations person. The reporter explained that his girlfriend majored in PR in college, she needs a job and would be a good hire for his company. What would you do? 6. You are the editor of a daily newspaper and you have an impressive college intern who is doing a terrific job covering concerts and interviewing touring musicians. One day you get an email urging you to compare recent stories in The New York Times with the stories written by the intern. You realize the student plagiarized the stories. What would you do? 7. You are the editor of a newspaper that has a strict policy against accepting gifts or favors, from news sources or advertisers or people in the communty. All such offers are to be declined. One day in mid-December, the newsroom receptionist knocks on your office door and tells you a woman wants to talk to you. Standing near the receptionist’s desk is an older woman holding a tray of homemade Christmas cookies. She wants to give you the cookies in appreciation for the coverage of her organization’s work in the community. What would you do? 1. This topic was discussed during our visit to Colorado Mesa University in Grand Junction on Oct. 1, the day a gunman killed nine people on a community college campus in Roseburg, Ore. Some of the CMU students criticized the news media for “glorifying” the shooters in these incidents and said the news coverage encourages copycat killings. When asked which news outlets glorify the gunmen, no one could cite an example. But they said using the gunman’s name and photo in stories gives him the noteriety he sought. The students were asked two local news questions: If a similar incident occurred on the CMU campus, would they want to know the identity of the gunman? Would they want to know the gunman’s motive? Some students said the victims are forgotten while the gunman’s name is used repeatedly in stories. The four-month Aurora theater shooting trial was cited as an example. It was pointed out by one of the editors that many of the news organizations that covered the trial devoted space or time to the victims and their families. And the judge listened to comments by the families during the sentencing phase, and those were reported. A. Many young people don’t read newspapers or watch TV news. They get their information from the Internet and social media. It is there that the copycats learn about the shooting at Umpqua Community College. B. “Don’t shoot the messenger” is how to describe reaction to the bearer of bad news – but that would have been an unwelcome way to phrase it in this discussion. “Don’t blame the messenger” if you don’t like the message, one member of the visitation team said. 2. The SPJ Code of Ethics advises journalists to act independently by avoiding “conflicts of interest, real or perceived. Disclose unavoidable conflicts.” Simply stated: Journalists should report the story, not become a part ot it. The students wrestled with this, attempting to balance their obligation as a reporter with their humanistic desire to help the refugee. In each campus discussion, they said the reporter shouldn’t give the refugee anything during the interview. However, after the camera was turned off, many said they would give the man water or food or clothing. 4. The visitation team explained two points before asking the students for their opinions: 1. News organizations must be profitable and that means healthy advertising revenue. 2. The ad department often can provide good story tips to the newsroom. What did the editor do? After receiving the phone call, the editor called the reporter into his office and closed the door. He asked the reporter if he lobbied the businessman to hire his girlfriend. The reporter admitted he did because they needed two incomes to pay their living expenses. After explaining why his actions hurt the newspaper’s credibility, the editor fired the reporter and told him to remove his personal belongings from his desk. His final paycheck was mailed to him. 7. According to the SPJ Code of Ethics, journalists should “refuse gifts, favors, fees, free travel and special treatment.” That sounds simple enough but this was awkward. As people in the newsroom watched, the editor thanked the woman and started to explain why he couldn’t accept the cookies. Would the woman understand the reason? Would she be embarrassed? After a few seconds, he thanked her and took the tray of cookies to the employee break room. However, clinging to the remaining shred of his ethical beliefs, he didn’t eat any of the cookies. Investigative freelancer April Nowicki, left, Denver Post reporter Elizabeth Hernandez and Fort Collins Coloradoan reporter Adrian Garcia at the journalism meet and greet on Oct. 16 at the Denver Press Club. 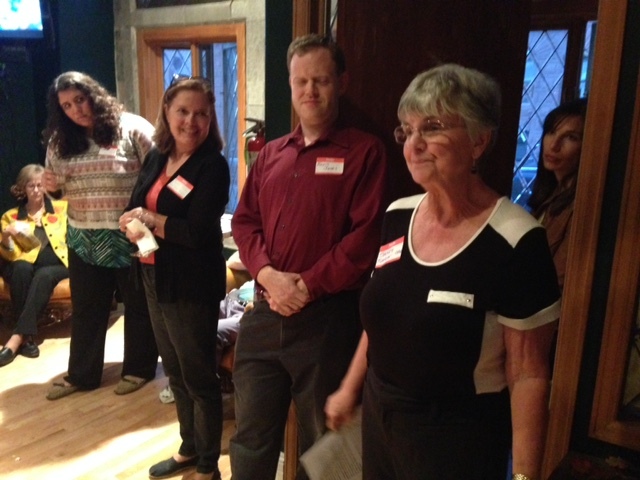 The event was hosted by the Colorado Pro Chapter of the Society of Professional Journalists. 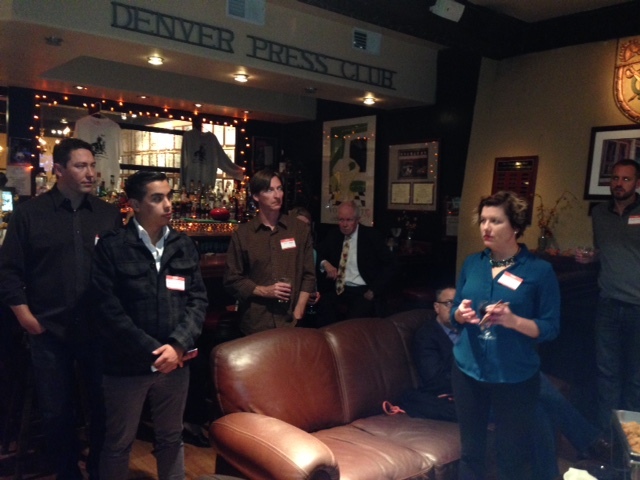 Representatives of state and national journalism associations talked about their organizations at the journalism meet and greet social on Oct. 16 at the Denver Press Club. 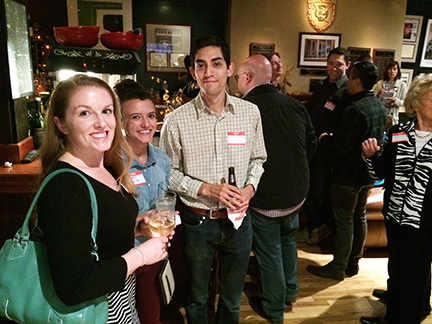 The Colorado Pro chapter of the Society of Professional Journalists hosted the event to encourage networking among the groups and for people to become familiar with the organizations. 9News KUSA executive producer Nicole Vap answers a question about the Investigative Reporters and Editors organization at the journalism meet and greet social on Oct. 16 at the Denver Press Club, The event was sponsored by the Colorado Pro Chapter of the Society of Professional Journalists. 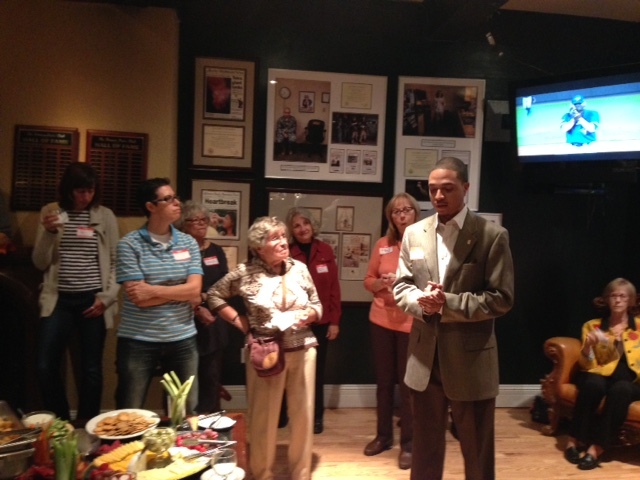 Aurora Public Schools communications specialist Julius Vaughns, vice president of affiliated professionals and treasurer of the Colorado Association of Black Journalists, explains his organization’s activities at the journalism meet and greet social on Oct. 16 at the Denver Press Club. 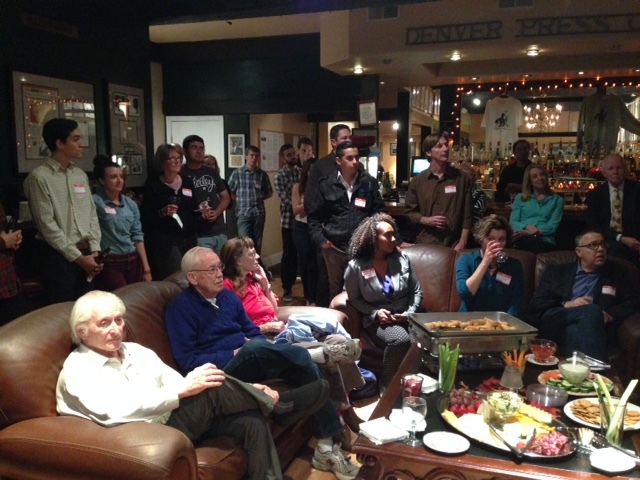 The event was sponsored by the Colorado Pro Chapter of the Society of Professional Journalists. Colorado Press Women president Sandy Nance, right, explains her organization’s goals at the journalism meet and greet social on Oct. 16 at the Denver Press Club. 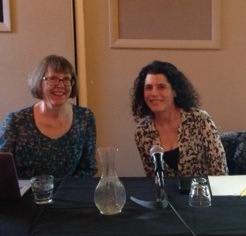 The event was sponsored by the Colorado Pro Chapter of the Society of Professional Journalists.